Manny Pacquiao: A man with a satisfied mind? This past Saturday night, almost two years since his controversial decision loss to Timothy Bradley, Manny Pacquiao was able to claim a well deserved victory over the previously unbeaten Bradley. It looked like a tough match for both men, but in the second half of the fight, it was Pacquiao that picked up the pace, while Bradley looked like he was leaking stamina as the rounds went on. But is Pacquiao truly satisfied with his history with Bradley? Does Manny’s victory over Bradley label Timothy as Pacquiao’s past? Pacquiao’s first loss to Bradley, be it controversial, is still a defeat, leaving them even. 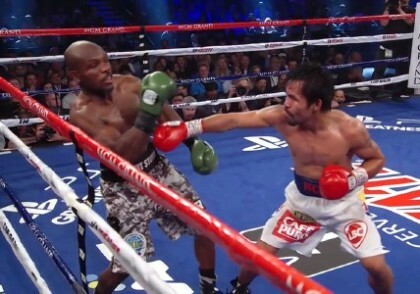 Being that Pacquiao is not one to avoid a fight and a challenge, as per his long lasting rivalry with Juan Manuel Marquez, it is not out of the question that we will be looking at a Pacquiao vs. Bradley Trilogy. Unless Juan Manuel Marquez comes out victorious against Mike Alvarado on May 17th, and they can work out another fight deal with team Pacquiao, Manny’s best option will undoubtedly be another fight again Bradley. Truth be told, I would support that option. They put on a tremendous show, full of action and excitement. I would strongly suggest that there weren’t many boxing fans that could downplay this past Saturday night, and claim it to be uneventful. While it might not generate the kind of profits that a fight against Marquez would, unless Mayweather Jr. makes an effort to secure a bout against Pacquiao, a fight against Bradley might be the next logical choice for Manny. You are here: Home / Boxing News / Manny Pacquiao: A man with a satisfied mind?